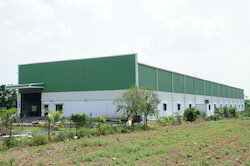 We are a leading Service Provider of industrial shed design from Pune, India. We are an illustrious organization that is engaged in manufacturing, supplying and exporting Industrial Shed Design that is highly demanded by factories worldwide. We use good quality raw material top fabricate these sheds. These sheds are easy to install and are available in customer's given specification to make them avail the desired product.